Downtime is costly in many ways, which is why executives in charge of Maintenance Repair and Overhaul (MRO) operations at Delta Airlines are implementing total productive maintenance (TPM) at their facility in Atlanta, Georgia. Their half-mile-long facility houses one of the largest machine shops in the United States. Delta Technical Operations handles MRO on jet engines not just for its own planes, but for the fleets of many other companies as well. One of the hangars in Atlanta is the largest three-sided standing facility in the world. 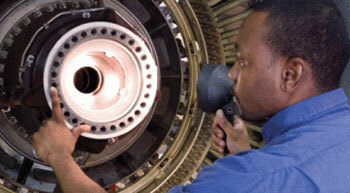 Servicing jet engines is a fast-paced, demanding business. When a machine in its shop goes down, Delta not only bears the cost of repairing that machine but may also face fines or penalties from a customer if work on that customer’s engine is not completed in time. “All of our contractors are very strict,” says Bush Denney, lead mechanic. The TPM initiative began in 2009 and is already yielding results. Before the program, Department 300, the largest of multiple machine shops at the facility, averaged 11 machine breakdowns per day. A year later, that number is down 73 percent, to only three breakdowns per day. And managers found that 90 percent of work orders submitted before the program started would have been averted if a TPM program had been in place. Producing those results involved many aspects, including addressing management issues, creating employee buy-in, establishing teams, conducting annual inspections, scheduling, measuring, and the impact on customer service. One example Denney cites is how operators now inspect to make sure fluid levels are correct on machines that have large spindles. When fluids are too low, the machine seizes, which means the spindle must be repaired (at a cost of $40,000) or replaced ($100,000). “We won’t lose another spindle,” says Sharon Robinson, aviation maintenance technician. These machine inspections have been a major part of the TPM initiative so far. “Our inspections are probably the biggest part of it,” notes Robinson. As she and Denney (her boss) described their TPM initiative at the Productivity Inc. TPM Conference. The overall ‘owner’ of the initiative is their boss, David Hall, who is product line manager. When a machine fails, work teams now conduct a TPM failure investigation, which not only examines what happened, but is intended to produce a solution for preventing the same type of failure in the future. The company is also involved in developing mistake-proofing efforts and visual controls, and making sure all machines have visible maintenance manuals that are current. Maintenance is now being scheduled daily, weekly and monthly, depending on the particular need. Teams are being created, with one person as a daily, weekly or monthly coordinator for each shop, and for scheduled inspections. And training is getting under way. In some ways, the Delta initiative is different from TPM programs at some other companies, where there is a greater focus on operator based maintenance. Delta’s strict standard work regulations limit how much they can involve operators. Denney runs equipment maintenance, with a full staff of dedicated mechanics, many of them aircraft or power-plant licensed. When dealing with some of the laser-balanced, highly sensitive and technical equipment in Atlanta, “only those trained and with years of experience should be dealing with that,” he says. Change doesn’t happen overnight, but significant improvement can be made in a short amount of time if you have management commitment and an understanding that it will take time and resources to be successful. Develop teams that include both operators and mechanics to work together to achieve your goals and set up a tracking system before you begin the program to monitor your progress and allow you to take countermeasures should they be needed. Can you solve the same problem twice? Recently we were invited to help a metal manufacturer with two business units and several production facilities address the issue of their continued under-performance; despite what the company felt was a herculean effort to drive cost from their system.